So Joburg is a pretty exciting city to live in here in South Africa. Especially in the last few years, things have really gotten next-level! From Mellville night-time madness, Maboneng ‘Sunday Funday’, clubbing in Braam (bru) and an endless list of incredible markets cropping up all over the city – there really is no excuse for spending another weekend hungover on the couch. This weekend has been another epic edition of life and I thought I would share it with you all! 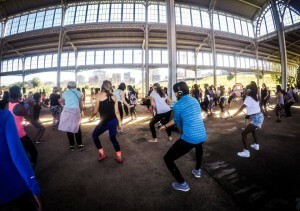 Saturday morning started off bright and early as myself and a few friends headed off to Secret Saturday – the early morning silent disco dance party which takes place at different locations in Johannesburg. 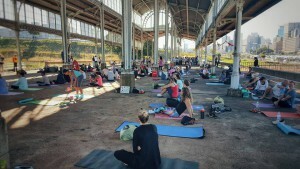 This time the event took place on a weekend at the Old Railway station in Newtown, Joburg. Having never been to this venue before I had no idea what to expect, but walking in, we knew we were all in for something really special. The building stands eloquently, albeit somewhat stranded, in the middle of the Newtown, and has a fascinating history. The Station, having originally been built in Holland in 1895, was erected in Joburg between 1896-1898, moved to Pretoria for several years and then re-erected back in Park Station in the early 2000’s. In awe, we quickly joined the others to start the morning with an hour of Yoga and Tai Chi. As I looked around, I couldn’t believe the number of people who had turned up at such a delicate hour on a Saturday morning. With around 200 bodies moving in unison through a series of warrior, downward-facing dog and plank poses I could feel my body and heart warm to the day. After a beautiful session of Yoga, we then grabbed our headphones, pulled up our socks and got ready for the next part of the morning – the silent disco party! Having been to several awesome Secret Sunrise events, I did not think that they could get any better. I was wrong. With “Change” as the theme of the day, I couldn’t help but feeling inspired dancing underneath this beautiful antique facade, watching how this incredible city has evolved, and inviting the changes in my own life. We danced, we danced, oh how we DANCED! After the blood pumping hour, we were treated to a live performance by the talented Jamie-Lee Sexton and DJ sets by the Everybody Loves Everybody crew whilst picnicking under Joburg blue skies. Bliss! 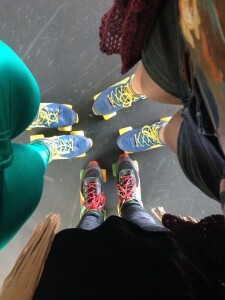 With such a winning Saturday, we were going to need to step it up a notch for Sunday Funday – and somehow starting the day dressed up in velvet and lumo tights rollerskating to Snoop Dog just felt like the right thing to do. So off we headed to Rolling Cherry in Maboneng for a morning of epic roller derby fun. Um… how do you ice skate again? I’m so ready to go Pro! Basically, the most fun EVER. A 3-hour session will set you back around R100 – and is worth every cent. After roller-skating funzies we made our way to the Market on Main to make up for lost calories on a selection of Belgian wraps, Greek spanakopita, springrolls and ALL THE CAKE. 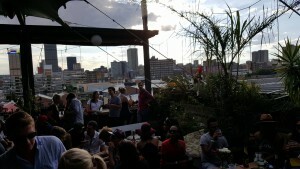 Of course no Sunday in Maboneng would be complete without ending the day at Joburg’s hottest Sunday spot – The Living Room. Get there early to grab a table and enjoy hot House DJ sets, delicious tapas, people-watching and dance the afternoon away with one of the best Joburg city skyline views around. All-in-all an incredible weekend exploring this amazing city of ours, dancing, moving, connecting, living. Photo Credit: Michelle Smit and Machteld Jurriaans.